Elder John Jones serves as an Adult Church School Instructor, a counselor with the Mount Zion Fellowship Community Development Center’s Pre-Marriage Counseling Program, and as a Trustee Board member of Mount Zion Fellowship. He was educated in Cleveland Public Schools. After graduation, he attended Miami University, where he majored in Mathematics. In 1983, Elder Jones came to Mount Zion Fellowship, under the pastorate of Dr. Williams. 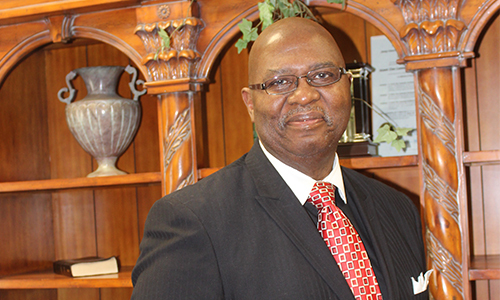 In 1986, he became the first Elder to be ordained at Mount Zion Fellowship. His devotion to Dr. Williams and Mount Zion Fellowship has not wavered in the 30 years he has served. He also shares his many God-given talents with the Voices of Koinonia and is a certified Conflict Resolution Mediator. Elder Jones has been married for over 34 years to wife, Deaconess Karen, and has two children.